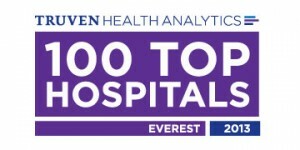 Northern Virginia Radiology Consultants, (NVRC), is proud to announce that Virginia Hospital Center has been named one of the Nation’s 100 Top Hospitals by Truven Health Analytics. Virginia Hospital Center is also the only hospital in the Washington, DC area to be named a 2013 Everest Award winner, denoting the highest current performance and the fastest long-term improvement over five years. This accolade was awarded to only 17 of the top 100 hospitals. As the provider of all diagnostic and interventional radiology, NRVC works closely with the hospital to provide the most advanced radiology services for all of our patients in a compassionate, caring, and professional environment. For more information about Virginia Hospital Center and their new designation, please visit: http://www.virginiahospitalcenter.com.